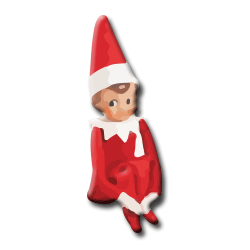 The Elf on the Shelf: A Christmas Tradition is basically a child behavior modification kit containing a hardcover book and a “scout elf”. The book explains that these elves are how Santa Claus learns which children are naughty and which are nice. Santa sends his elves out to be adopted by families in these kits. The families are to read the book, name the elf, and register the adoption online. Then the elf receives its Christmas magic, allowing it to fly to the North Pole at night and report the family’s activities to Santa Claus. Then it flies home before morning for another day’s spying activities. The family is not to touch the elf, or it may lose its magic, and not be able to fly home to the North Pole. On Christmas Eve, the elf flies home to the North Pole, until next Thanksgiving, when it starts all over again. However, the real truth is, the parents have to remember to move the elf around and night, and keep up the lie to their children, in order to be able to use the elf as leverage to make their kids behave. I do have to give kudos to the authors, who self-published after being rejected from major publishers. This product is a major success story. They even got a Christmas special on network TV! What does the elf do on the nights he doesn’t return to the North Pole? These creatures obviously don’t need sleep, so they are creeping around the house doing who knows what at night. You want to tell your kids there isn’t a monster under the bed, but there sure as hell could be a magical elf spy? We don’t want spyware on our computer, but we’ll take a magical creature into our house that reports on all our activities to another magical creature every night? Won’t the child be terrified to touch the elf, even accidentally? If a child does touch the elf, won’t they spend the whole day and night scared that they have taken away the elf’s magic? If the child does something naughty, and doesn’t want Santa to find out, then the child is faced with a gangland style dilemma. Does he touch the elf, possibly taking away the elf’s ability to get home, in order to cover up his bad deed? If the child discovers the elf in a box in June, won’t they be horrified that the elf did not actually make it home to go frolic with his elf friends? Some parents have the elves do naughty things around the house while everyone is sleeping, like making messes or hiding things. So it’s ok if the elf does it? But if the children do it then Santa will give them coal instead of presents? I bet some parents will put the elf on the kid’s nightstand. That will freak some kids out, waking up to see the magical don’t-touch-me elf staring at them. Do the elves WANT to go on a month-long business trip or is this some sort of elf punishment from Santa? Did you just adopt a disgruntled elf in extended time-out? As if the whole Santa Claus thing doesn’t give the poor children enough angst, the Elf on the Shelf adds so much more guilt. Why do we have to scare or guilt our children into being good? Values and morals can be taught without fear of Santa Claus, magical elves, or deities. There are real-life consequences for doing good deeds, being kind to others, achieving in school. Recognizing your child’s deeds and pointing out the consequences of the both good and bad actions is quite effective. If you want your child to trust you when it really matters, don’t lie to them in exchange for one month of lazy parenting.